Saratoga Selected Yearlings sale hits town again from August 7-8. Terence Collier, top right, looks for bidders in the crowd as Hip 210 by Tapit out of Inspired eyes potential owners, and bidding climbs to $735,000. Fasig-Tipton’s Humphrey S. Finney Sales Pavilion on East Avenue will come alive again on Oct. 16 for the Saratoga Fall Sale, with 298 yearlings listed in the catalogue. The Saratoga Selected Yearlings Sale on Aug. 7-8 and New York Bred Preferred Yearling Sale on Aug. 12-13 were soon to get underway when Terence Collier, director of marketing at Fasig-Tipton, shared his thoughts with Saratoga Living at a kick-off party on a balmy Aug. 5 night. Collier was joined by Adrian Wallace of Coolmore Stud, Wayne and Tina Evans of W&T Thoroughbred Holdings, Cheryl Prudhomme and Dr. Michael Gallivan of Shamrock Hill Farm and Bayne Welker, vice president of sales, as he chatted about his time at Fasig-Tipton. A native of Kent, England, Collier still has his British accent, which adds to his style. How did you end up at Fasig-Tipton? I am the oldest living member at Fasig-Tipton; I joined the company in 1976 and I haven’t missed a Saratoga season. I never worked for any other thoroughbred auction company. I started off in the Merchant Navy, on the Queen Mary and Queen Elizabeth, and I met my girlfriend on a blind date as the Queen Mary was being refitted to go to Long Beach for perpetual mooring. My girlfriend’s parents told me I had to work, so she got me a job on a horse farm, and I literally did not know which end bit and which end kicked, but I loved it… I was 23, and I’m still married to her. I work in Lexington, Kentucky. We sell in Miami, Maryland, Kentucky and in Saratoga. We have about 14 sales, about 25 days of sales yearly, so I do all of the auctions. I look after most of the marketing, the promotion, and I come back to Saratoga around the first week of August, a week before sales start. We leave right after the New York sale, and then we come back again in October, and that’s a treat because it’s quiet and it’s beautiful here in fall. How long has Fasig-Tipton been in Saratoga? Humphrey Finney, whose bronze is in the Pavilion, was very respected and he re-formed Fasig-Tipton in 1953 after the war. There had been a temporary shutdown of Saratoga because the American government forbade any non-essential transport of goods, so they couldn’t get their horses on trains from Kentucky or Pennsylvania to bring them up here. Fasig-Tipton auctions pretty much shut down during the war years. This is the 97th year of Saratoga proper, and the sales started in 1913, and there was this hiatus until 1946 or ’47. In the 1950s, Fasig-Tipton bore no resemblance to what we have now. It wasn’t anywhere near so sophisticated — just a walking ring and a grass paddock. Bidding reached $1 million for Hip 186 by Orb, out of Flashy American. Why come to Saratoga to buy or sell a horse? Saratoga became the place outside of Lexington to sell your horse. 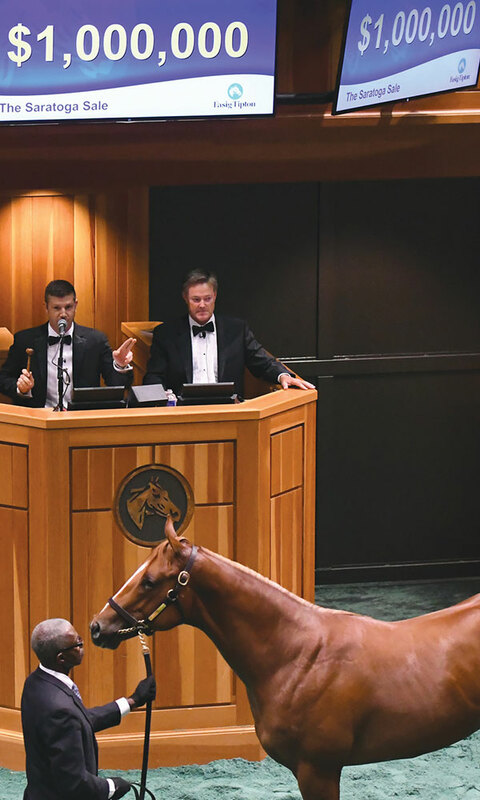 This sale became dominated by Virginians, Pennsylvanians, New Jerseyians, New York people — everybody but the Kentucky core of thoroughbred breeders. If you felt frozen out of Kentucky, you came here. The industry focused itself on Kentucky. How has Fasig-Tipton changed with the times? 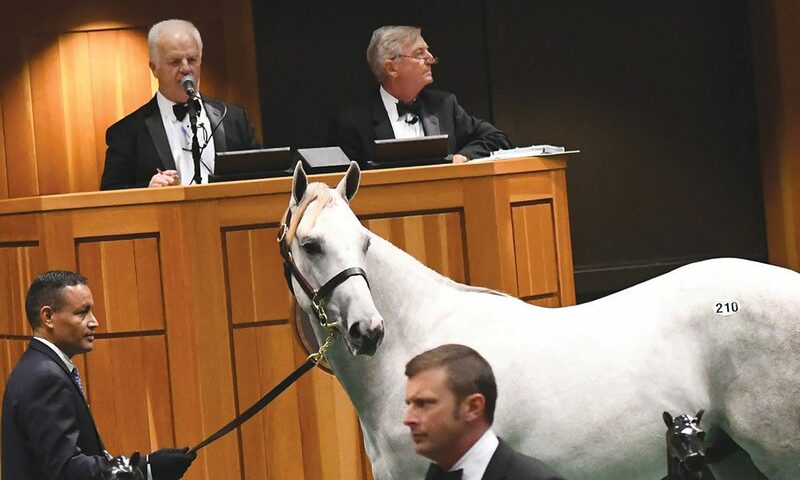 The big change that’s happened to us that’s been very positive for this company, and this sale in particular, is the incredible growth of the New York Thoroughbred Breeding Program. When I started with Fasig-Tipton in 1976, I was loaned to the New York Breeding and Development Fund to promote their program for at least 10 years, and the growth of the New York Breeding Program has not only established the second weekend here, which means we are here for two different sales in the summer, it’s changed the whole dynamic of us selling at Saratoga. We are delighted it’s been so successful. We had started the October sales back in the 1980s and it failed, but you can never say an idea was a bad idea … it’s the same idea brought back again at another time and suddenly it catches on. How does Fasig-Tipton feel about Saratoga? We adore the town. One of the things we really enjoy, even though we’re only here for two weeks of a 50-week year essentially, our marketing program tries to draw itself into the Saratoga community — the sponsors, the car dealers and the restaurants — so that we’re not seen as some bloody old carpetbagger that comes up here, cleans up, moves out and doesn’t care about the town. We really care about the community and about maintaining the beauty of this place. How does Saratoga compare with other sales? In terms of the average price for horses paid, Saratoga is one of the top three in the world. So Saratoga is very important to the Thoroughbred industry. The prices have been growing the past three years, and I think you’ll see some more growth this year… there’s some really good vibes, but it will all be in the record and it will speak for itself. We are hoping there will be a fairly strong sale. Sales companies get paid 5 percent of the bottom line, and to maintain that progression, you’ve got to get the people who sell here to be happy, bring their horse here, get what they expect for it, and go home happy. Then they bring us more horses the next year. They’ve brought us more horses this year, we’ve got more buyers, and I have a feeling that the mood in the country — there’s so much cash splashing around — and all of our big investors are really keen on the business and really want to spend their money. How has the national economy affected sales? The business was flat for five or six years; in the last two or three years, it’s showing the same growth that the economy is showing. It’s slight, but nevertheless, it’s an upward trend. And I think this year will be the first substantial growth that you see in the October receipts for the sale. I think we’ll walk out of here with a lot more money in our pockets as a result of these two sales. We’re going to have a very positive experience here; everybody’s responding well and the weather’s cooperating.